Very nice built very strong. High quality U.S.A. bolts. Looks awesome. Time Will tell. 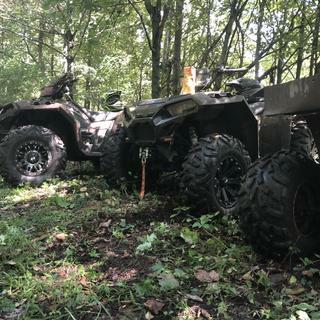 Don't forget to buy longer or security lug nuts, stock won't work on any 12mm stud RZR s.
There is nothing i dont like about them. They look good and ride good. So far, they have taken a lot of abuse and are still rolling fine! Awesome fit and finish! No issues mounting tires easy to follow instructions. Great pricing for beadlocks also. Wheels were to my exspectations! Highly recommended! Really like the look of these rims. Mounting the tires was very easy due to the beadlocks. Did receive one that was scratched. Made a call and warranty claim and a new one was shipped no questions asked. That is how business should be done. Will buy from ROCKY MOUNTAIN again! Great fit and finish. Lite weight! Complemented my ride very well! Nice rims well built strong.. Just alittle heavy.. 18lbs give or take.. 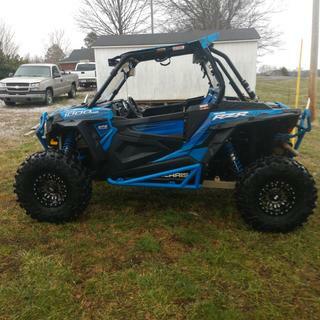 Rings r nice 1/2 socket bolts..torque them to 10lbs then do it again to 20lbs and u should have no problems..valve stem in good spot short and easy to put air in..
Only issue with this rim is related to the location of the valve stem. This is basically a wheel design issue. There is very little room for the valve stem, so placing your index finger and thumb on the cap to unscrew it is difficult. An option would be to install an angled valve stem, but then it would stick out and be vulnerable to damage. On the up-side, the valve stem is very protected. Just expect frustration when trying to remove and reinstall the cap. 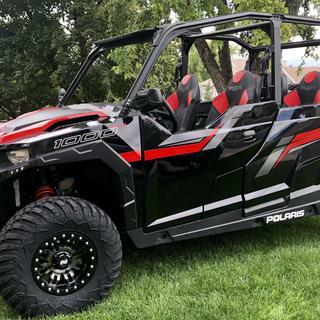 Don’t have a lot of miles on yet, they definitely gave my RZR a great look. These are awesome wheels especially for the price. I will probably buy another set. 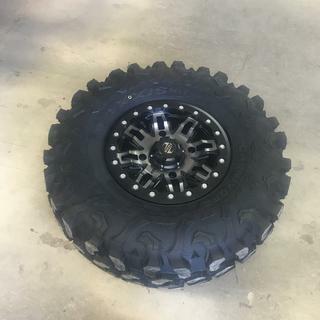 I bought these wheels to compliment the Tusk Terrabite Tires. The wheels look fantastic, and so far the finish is holding up nicely. The only thing that could be improved is the location of the valve stems. They are in the narrow portion of the spokes and difficult to access the stem caps easily. It takes some two finger manipulation and the edges of the spokes are a little sharp. Overall, an excellent product, great value, and piece of mind with the bead locks. 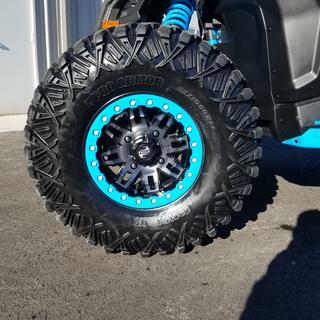 Tusk Terrabite tires on Tusk Teton Beadlock wheels. Love these Tusk Beadlocks, can’t beat the price. Quality, good looking, affordable. 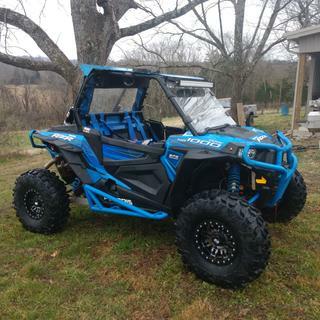 Only thing I’d change are the bead lock bolts to black. Nice wheel for the money. Fast shipping, arrived in three days in perfect condition. Valve stems were already installed easing installation of tires. 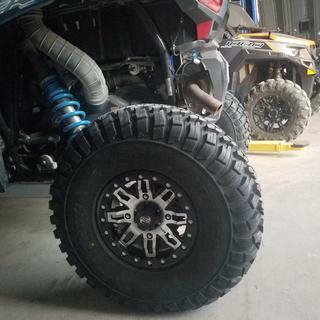 Tires mounted easily with no leaks. Love the look, can't wait to test them out! Haven’t had them for too long so no long term info. But they look good, easy to mount, and have held up well to my abuse so far. 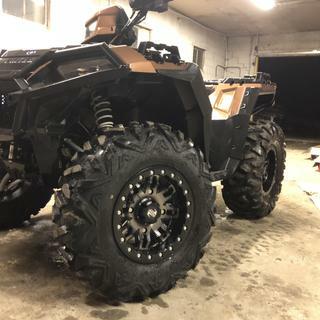 I just purchased these wheels for my 2018 Polaris General 4. I love the look And haven’t had a problem with the bead lock leaking at all like some bead lock wheels have. I really like the fact that the bead lock ring bolts are recessed! These are a quality bead lock! 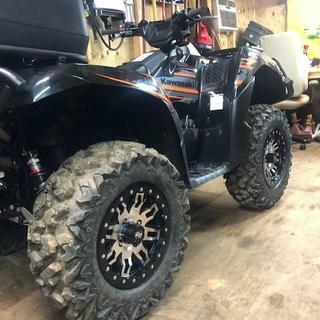 30” terribite tires mounted on them just to polish them off!! 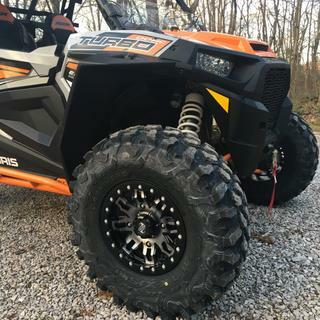 I wanted some bead lock wheels for my RZR, but I couldn’t justify the price most places are asking for them. Then I found these and they were IMO better looking than anything I had see so far and I couldn’t beat the price. Combined them with a new set of 32” terabytes and they make a great package and look perfect for what I was looking for. Can’t wait to get them out and see how they perform on the trails around northern Michigan now! So far I have had good luck w/ these wheels. Has bigger bolts for the bead lock rings. Hoping they will keep from twisting off like some of the smaller ones. I did use anti-seize on the bolt. 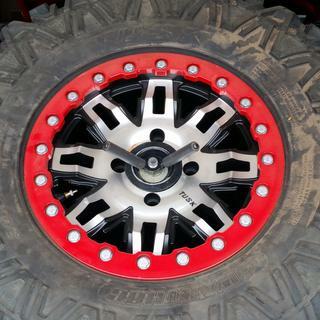 These are nice rims hold up good in the gravel no rock chips or scratches going threw rough terrain. Light weight . These wheels are great very happy with the new wheels! Will absolutely recommend to anybody thats looking for a tough durable beadlock wheel. Thank you Rocky Mountain for your tusk brand! The absolute best parts at the best prices! Have been getting compliments on these rims since the first day I purchased them. 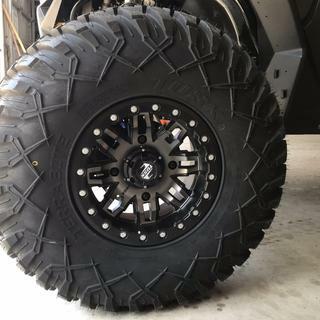 So far these have been a very good rim, love the looks & painted the rig to match YXZ rims. Love these Rims & tires, painted ring myself. 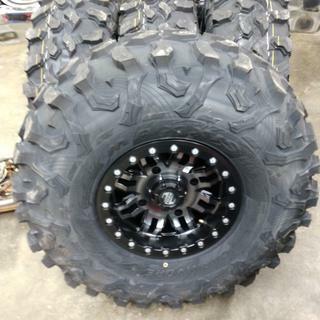 I mounted these on my 900S with some Carnivores that I was already running on non beadlock wheels. These are listed as +30mm offset and they put me pretty close to stock width again although I have not measured width. 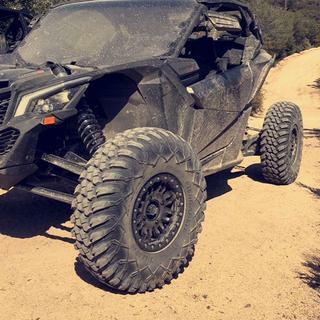 Mounted tires, aired them up to 10# and took them for a short ride (10 miles) before a Moab trip. I retorqued the bolts before we left and didnt have any issues with leaks on our trip. 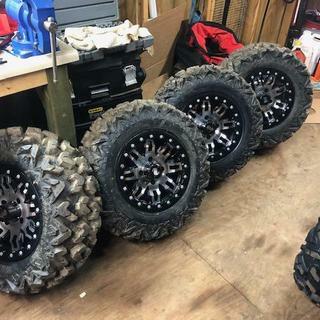 Ran them at 7# in Moab and they worked great. I am very happy with them. A very nice wheel for the price. A very nice looking wheel that is well constructed. Gun Metal Grey is a lot darker in person than the photos show. Sorta on the heavy side for a beadlock wheel. Nice that it comes in 5+2 back spacing and also the zinc plated bolts versus the cadmium gold bolts on most wheels that look like they came from a Hardware store. Seem to be holding air better than some beadlock wheels. Wheels perform well, not too heavy, appear durable and look great on my x3. 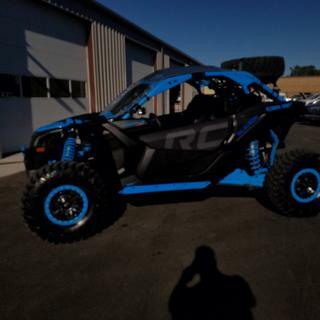 What lugs will i need for a 2017 rzr? 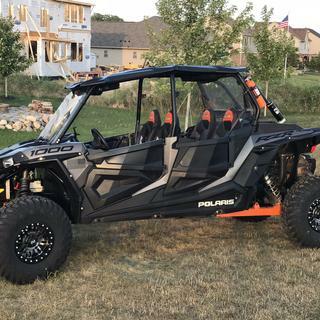 Part # 1782070001 for my 2015 RZR, guessing this would be the same. Don't forget Tusk Spline Drive Lug Nut Key Part # 1782000001. Hope this helps, make sure you get the correct backspacing on the wheels, there is a chart that explains closest to stock and the other 2 options are wider and narrower. I used the Motosport Alloys Spline Drive Lug in 12mm x 1.50tpi. They are part number 1442770005 for the black ones. You will also need the Motosport lug socket key to fit them. Part number 155850001. However, the holes in this particular wheel are large enough the factory lugs and socked should fit. The black Motosport lugs look better though. Hope this helps. I purchased the black matching lugs that they recommend and they look and work great. 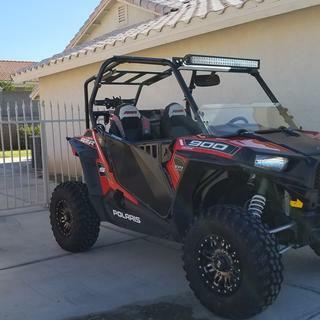 Tires/rims came and mounted with no problem and look awesome on my Honda Pioneer 1000-5. Not at home but they are the same lug type as stock. I bought a set at AutoZone with the lug socket. Customer service should be able to assist. What are the torque specs for the bead lock rings? BEST ANSWER: 20 ft lbs according to the instructions included w/ the ones I purchased. They they come with valve stems installed? BEST ANSWER: No you have to otder the valve stems separate. If you're ordering a tire and wheel combo then if you order the valve stems, everything will come preassembled/installed. By the way, I am very happy with my Tusk wheels and get a lot of compliments on them. They were not included in my order. I had to order valve stems and bought a valve stem puller at a local auto parts store. They do not come with valve stems , so you will have to purchase new ones or use old ones. Yes, mine did come with valve stems installed. Do these beadlock wheels come with the plastic center cap like the non beadlock Tusk wheels? BEST ANSWER: Yes, these do come with a plastic center cap. Wheels are really nice. Yes. They do come with the center cap. Why is there an option to select front or rear? BEST ANSWER: In almost all machines until just recently the front and rear rims widths are different from the factory. If you wanted to order a square set up you will be best off to call in the order. I did that so I could change the factory offset and order a square set up. 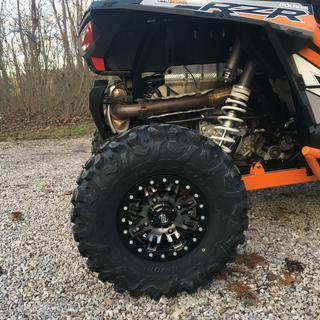 These rims are awesome and have held up well under the beating that I have given them so far. 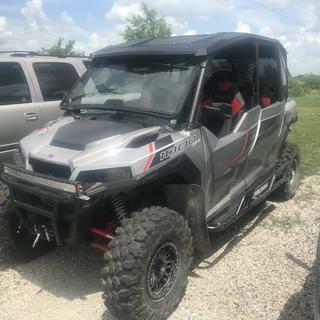 I think it's vehicle specific, for my RZR 1000 they were all the same, but i think some of the Honda 4-wheelers have different sizes? Might ask the RTM experts for your machine. One note of reference, these wheels require special lug nuts, which may be different than stock. You have to choose the offset required if you want different wheels for front and rear. Most run same off set and width when going to aftermarket wheels and tires. My maverick turbo gained a couple inches in width in the front. I think that only pertains to tires , not wheels . My rims were 14x7 but the tires i otdered are 14x9x28’s on front , and 14x11x28 ‘s on rear . Offset options for front or rear. Are these wheels strong enough to take the abuse of racing short course? BEST ANSWER: I would think so based on my experience. 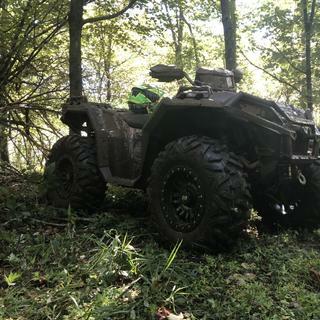 I have a set of them with 29x9x14's on my sportsman 1000 and have had no problems with them at all. I ride pretty hard through rocky mountain terrain and have sent it airborne at least 25 times without any issues with the rims. Granted I have a lot of rubber around mine, but I ride with 6lbs of air to help absorb and grab the rock. I have taken some hard hits to the sides on rocks and no structural damage. I have had mine for a year and zero issues. We ride really hard in the Rockies and they have held up strong. I don't race but I have 1000 miles of hard miles & so far no problem. Since these are painted and not powder coated, how has your paint held up. Do the wheels scratch easy? I have one bad scratch but I kissed a rock hard & it would not have mattered if it was powder coat or paint . So far they have held up great. Are there different colored beadlock rings available? BEST ANSWER: I don't think so, but it's just painted aluminum, scuff it with fine grit and paint whatever color you desire. I may just sand down and polish the aluminum. 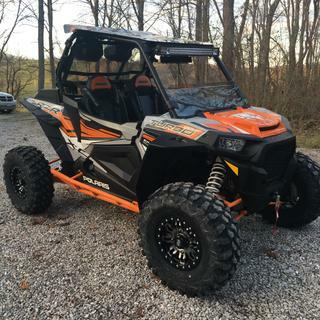 Hope this helps, i really like the looks on our RZR 1000, the only thing is the valve stem is kind of hard to get to? 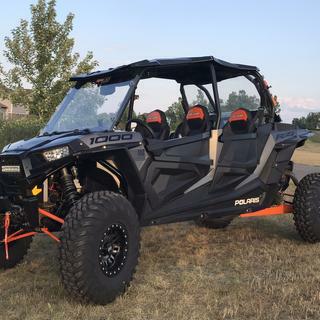 I do not think there is anything other than black available currently, but they could easily be painted or powder coated any color you choose as the rings bolt on and off quite easily. Not that I'm aware of, most people are painting or plastic spraying them to get the color they want. only black. FYI You could remove beadlock and get them powder coated any color you wanted . 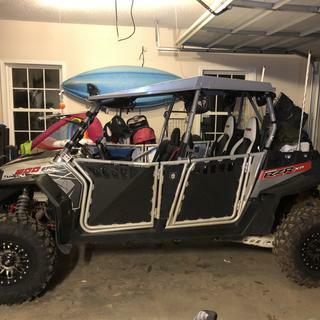 What is the weight difference for the 32"x10x15 Terrabite with Tusk 15" bead locks vs stock 2017 RZR XP 1000? Clutch work necessary? BEST ANSWER: When comparing to rears probably less than 5lbs, You do not "have" to do clutch work, but it is recommended when going larger than a 30" tire to help performance and reduce pre-mature wear on belts. Certainly no clutch work necessary! Does 5 +2 offset mean that the tire will stick out further from the bike relative to a 4 +3? I'm looking for the widest stance. To determine the diameter of a wheel: Measure the width of the bead area of the wheel (not the outer rim). In the diagram above, the diameter measures 12 inches. To determine the offset and width of a wheel: Measure from the center weld to the center of the tire bead area on both sides of the wheel. The outer measurement will be the one with the valve stem. The offset of a wheel is stated by reading the measurement of the inside first, then the measurement of the outside (valve stem side). For example: In the diagram above, the offset is 5+2; meaning the inside half of the wheel measured 5 inches, and the outside (valve stem side) measured 2 inches. Add these 2 numbers together to find the total width of the rim (7 inches). Zach the first number (5) is the inches of rim that will be inside of the mounting surface of the hub. The second number(+2) is how much sticks out from the mounting surface towards the outer lip of the rim. That said, a 5+2 offset will give you a narrower stance than a 4+3. Is 5+2 the offset that the stock rims are? 4+3 will stick out 1" farther than a 5+2. 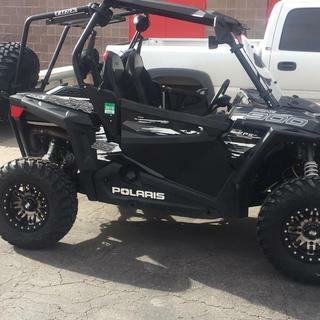 Is the bolt pattern on the Polaris razor 12 inch rim the same as the 14 inch rim? BEST ANSWER: Yes, the bolt pattern will never change. Do these wheels have any structural warranty? BEST ANSWER: These have a lifetime structural warranty and a one(1) year finish warranty. 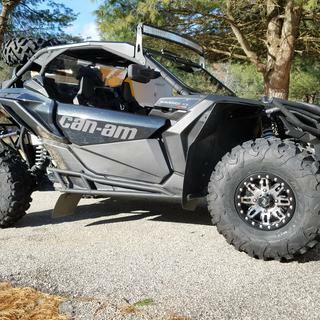 Will my stock 2017 Canam x3 lug nuts fit these rims? BEST ANSWER: Unfortunately, your stock lug nuts will not fit these rims. However, part number 1087210005 should fit. What is the warranty on Tusk wheels? 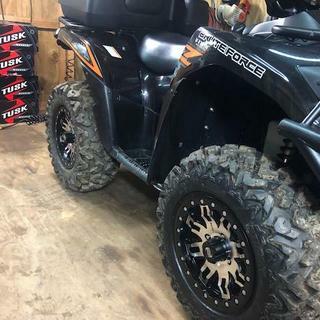 BEST ANSWER: Tusk wheels carry a limited warranty that protects your wheels in a structural failure under normal use applications. 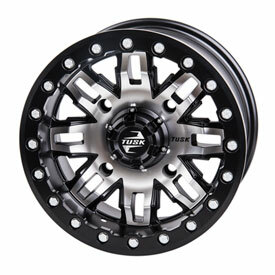 Tusk also holds a 1-year warranty against manufacture defects in the finish of the wheels. This warranty is only intended for the original retail purchaser. Will 3/8" lugs work with these wheels? what size valve stems do these take ? BEST ANSWER: These wheels use a standard valve stem. 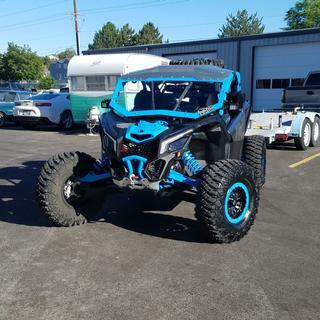 Rocky Mountain ATV/MC would offer a standard rubber valve stem or a standard Chrome valve stem for these wheels. Are the beadlock rings sold sereately and how much are they? BEST ANSWER: At this time the rings are not sold separately. Is there plans to do so? What do the 14x7 5+2 offset wheels weigh each?